It's (almost officially) the weekend and I'm already thinking of palazzo pants, sunglasses and poolside umbrellas. 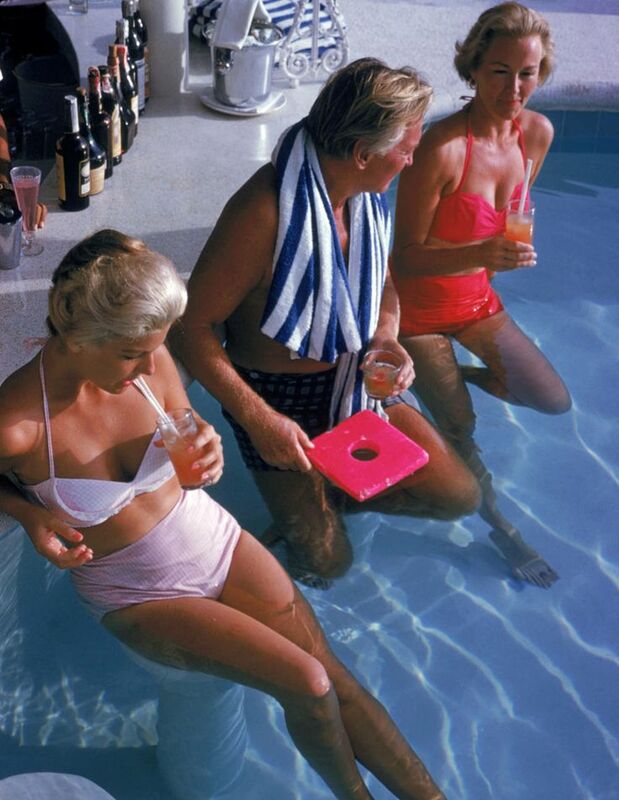 The life depicted in a Slim Aarons photograph seems ideal right now, doesn't it? Bronzed skin, a life of leisure and a (seemingly) stress-free existence in a picturesque environment. Enviable, no? Whether or not it's attainable for most, we can all agree that the life of luxury and ease captured in these timeless photographs casts a spell upon us. No matter our station in life, we all find the life of the jet set to be appealing. My local Trina Turk boutique does a fabulous job curating books. They always have a stash of Slim's books on hand and other Taschen & Rizzoli titles that evoke thoughts of the privileged lifestyle. It isn't that the good life doesn't exist today, it's that Slim's images remind us of days when we weren't hiding from the sun's rays or worrying so much about global events. It seems to be a celebration of "the now" in these storied photographs. No iphones, no disconnected friends. These photographs all capture people interacting with one another and these stunning locales. You long to be there and you desire to be them. Here are a few of my picks to get you in the jet set mood this weekend. May you sip your iced beverages with a bit more style and a lot more sophistication!